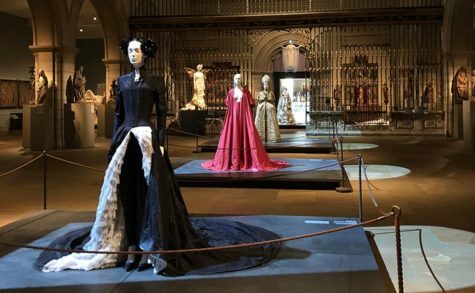 The Metropolitan Museum of Art in New York is rejoicing over the one millionth visitor to its largest ever exhibition, the Costume Institute’s Heavenly Bodies: Fashion and the Catholic Imagination, as of yesterday (23 August). The show of Papal vestments and accessories lent by the Vatican, 20th and 21st-century clothing inspired by Catholicism and medieval works from the Met’s collection (until 8 October), is now the most attended exhibition ever put on by the Costume Institute—and the third most attended show in the museum’s history. Heavenly Bodies has bumped another Vatican loan exhibition from the third-place spot: The Vatican Collections: the Papacy and Art, which drew around 897,000 visitors to see 237 works of art, textiles and other objects from the Vatican Museums, Apostolic Library, St Peter’s Basilica treasury and the papal apartments in 1983. Gaga Show: Where’s The Meat Dress?